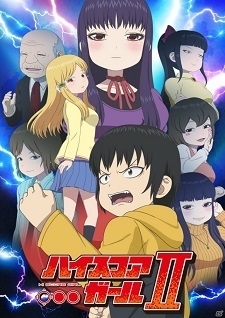 Super glad to see the High Score Girl franchise getting this well deserved Season 2 and hopefully it’ll go on to adapt the whole manga! Great teaser video, with that glorious soundtrack, to hype things up a bit! Looks like we’ll be seeing a few new characters and perhaps a different side of Oono too! Can’t wait! Fall Season is going to be a dime with this, Chihayafuru 3 and Vinland Saga, lads! Great news, enjoying the first season right now. You know what's the funny thing here, that almost all anime that are getting a sequel haven't been seen by me yet. Anyway, i guess its fans are gonna be happy, yee! Hopefully enough to finish the whole story. Surprised by this, since the manga has ended now (which was still ongoing when the first season was airing), and an anime is usually made to promote the ongoing source material, but this looks like it's going to be a complete adaptation. I know right, I was afraid we wouldn’t get this Season 2 for the exact same reason, but here it is! Wonderful surprise! Well, this is an anime done by Netflix, and I supose they don't work that way, since they've no relation with manga/light novel publishers. It wasn't done/ paid for by netflix, it was licensed by netflix, which is different. So it's a complete adaptation, I thought the OVA completes the story. Very excited for the sequel though. I see new characters, is that grown-up Akira? Awesome news! An anime that clearly needs to be watched by more people! Still have to watch the OVA tho, but damn was it an enjoyable and unique take on romance! Super excited! This time I plan to watch week-in week-out! Season 1 was a hidden gem! I have just finished watching the Extra Stage! Such a great news to read just after that cute ending! I had s1 on PTW, didn't have the time to watch tbf. I mean despite the CGI animation, I guess Ill watch s1 to see what's so good. Wow i had hopes this would get a season 2 but didn't think it would become a reality! Happy for it! Another manga getting full adaptation sure is good, I will get around to watch it on Netflix before it airs. Easily the most underappreciated anime of 2018. Really happy to see it getting the most likely full adaptation treatment ! Good news, this was a dark horse from Summer 2018 as it was a really lackluster season imo. Hopefully it catches up to the manga with the adaptation. Looking forward! Anime was indeed a mistake, since we prefer 2D waifu's over 3D wamen.